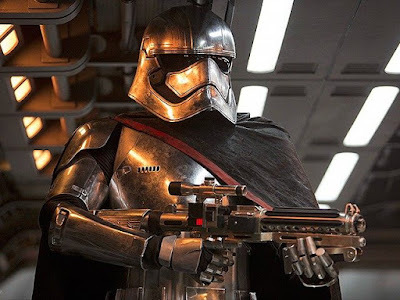 Star Wars: The Force Awakens opened widely on Friday, December 18, 2015. The film had limited showings earlier in the week, and some events have caused alarm. Even before the new Star Wars movie was nationally released in the US, the widest, most discussed level of theater security every reported has been noted by the media. Some theaters installed metal detectors, banned backpacks and costumes, and allowed patrons with nothing more than lightsabers to cos-play. In the wake of the Aurora theater shooting of 2012, the Lafayette movie shooting in July 2015, the attack at a performing venue in Paris a few months ago, and the San Bernardino terrorist shootings of last month, the Star Wars movie was considered a major target for trouble. There seems to have been some, but the media appears to have quieted what is really occurring. And the security is high. There have been hints of a few instances that have bothered theater owners this week. In an incident Wednesday night [December 16, 2015], two men in their 20s who were “Middle Eastern in appearance” and “spoke with a heavy foreign accent” entered a theater inside a mall in Tempe, Arizona, without tickets, and one of the men began recording video of the theater with his cellphone “in one slow swooping motion,” according to documentation of the incident obtained by Deadline. When asked what they were doing by theater security, the men replied they had “just wanted to see the restaurant,” pointing to the concession stand, and then exited the theater to a patio, where both men made phone calls. In a separate incident last week, a man reportedly drove up to a theater in Southern California and began asking suspicious questions including, “When are the most people here?” and “How crowded is it going to be this weekend?” before driving off in a car with no license plates. A second man reportedly drove up to the theater and asked similar questions, before again driving off in a car with no plates. ~ Source. The National Association of Theatre Owners (NATO) then sent a notice out to its members about these suspicious incidents, on Thursday, December 17, 2015, to be alert, aware, and heightened security. One film buyer who has the film booked on the majority of their screens said they have five security guards employed at each theater. “We’ve hired security at every location to be safe,” the buyer said. 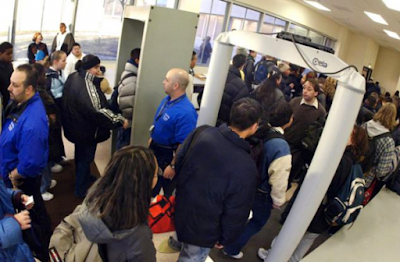 “We will have five (guards) posted and reserve the right to check (customers’) bags. We will not let anyone walk in with a backpack or anything larger than a purse, and whatever they are carrying will be checked.” ~ Deadline. Hundreds of moviegoers were briefly evacuated from the Pacific Theatres at the Grove in Fairfax on Thursday evening. The evacuation occurred after a fire alarm was triggered inside the building, said Officer Norma Eisenman of the Los Angeles Police Department's Media Relations Section. There was no threat to the theater or "anything else of that nature," she said.Several disgruntled movie fans took to Twitter and Instagram after the incident, which prompted a response from the Los Angeles Fire Department.Showings of the much-anticipated Star Wars: The Force Awakens were interrupted, according to witnesses. "As soon as the previews were over and the movie was about to start -- fire alarm. They evacuated the whole building," said an exasperated Andrew Gouch, adding that he had purchased his Star Wars tickets two months in advance. "My kids want to still sit in there but … I don't know," he said. "I don't drink; I may start. "The screenings resumed after firefighters determined that no fire had occurred and the building was safe. ~ Source. A showing of the new Star Wars movie was interrupted Friday in New Jersey after a theater was abruptly evacuated during the show. Friday night, police in Freehold Township announced that they had arrested a Middletown man and charged him with making a pair of bomb threats at the AMC Theater. On Monday evening, Dec. 14, and again on Friday afternoon, Dec. 18, notes were found in the men's room of the movie complex containing threats to either the theater management or specific threats of bombs inside the theater. One note on Friday afternoon read: "I'm coming for blood; 4pm bomb, 6pm empty mag in guests." ~ Source. How widespread are these security measures? 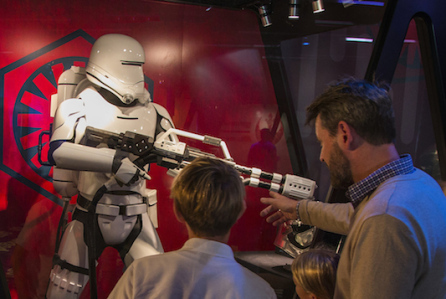 As of December 17, 2015, Disney (who owns the Star Wars franchise after George Lucas and Lucasfilms sold it to them) ceased the sales, display or brandishing of Star Wars blasters and any other type of toy guns as part of enhanced security policies. There are also new metal detectors at the entrance of California's Disneyland and Florida’s Disney World. Furthermore, there is now a ban on individuals over the age of 14 wearing costumes or masks on the properties. Similar measures are going in place at Universal theme parks across the nation, reportedly. Random more extensive checks will now occur too, in addition to the bag checks that have been taking place at the parks for years. Predictions, prevention and preparedness appear to be working. Sometimes paranoid is really total awareness.